A child was killed, dozens of homes were destroyed and hundreds of people were evacuated as wildfires swept across tens of thousands of acres in West Texas on Sunday, officials said. One firefighter suffered second-degree burns fighting a blaze near Colorado City, where a hospital and nursing home were evacuated as a 1,000-acre wildfire approached, according to the Texas Forest Service statement. 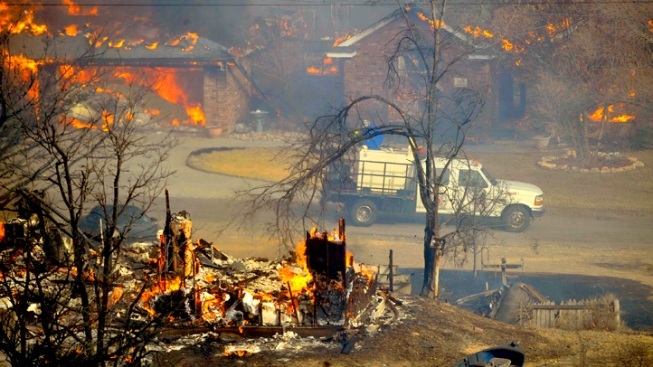 No other injuries were immediately reported, though the fires -- fueled by strong winds -- were threatening small towns from the Texas Panhandle and the southern plains. Heavy smoke from a wildfire near Midland was blamed for an eight-car accident along Interstate 20 that killed a 5-year-old girl. The roadway was shrouded in smoke when the pickup truck she was riding in was hit by a tractor-trailer, said Trooper John Barton of the Texas Department of Public Safety. Two other people were injured. The fires blackened about 121,000 acres and destroyed nearly 70 homes from the Panhandle to the Permian Basin and rolling plains, Texas Forest Service spokesman Lewis Kearney said. The largest fire burned 30,000 acres northeast of Amarillo, destroying dozens of homes and damaging several others, he said. Among the buildings destroyed was the Willow Creek Kennels, though it was unclear how many animals died in the blaze, said Donna Makkhavane, spokeswoman for the Amarillo-Potter-Randall Office of Emergency Management. Gusty winds that were fueling the fires weren't expected to diminish overnight, said Mark Stanford, chief of fire operations for the Texas Forest Service. He said the conditions were "very severe." Daniel Cook, a volunteer firefighter in Palisades, lost his home in the fires and said he heard the news over the radio. "I'm glad everyone got out safe," the 34-year-old Cook said, noting that his uncle and his two dogs safely fled the house. "There is nothing you can do. You can't stop what you're doing to go protect your home." Cook was staying at a shelter south of Amarillo at Cowboy Church that was set up after residents were evacuated. Cook said someone had recently told him that his "whole street was ash." Aircraft that help gather information about the scattered fires couldn't get into the air because of the winds. 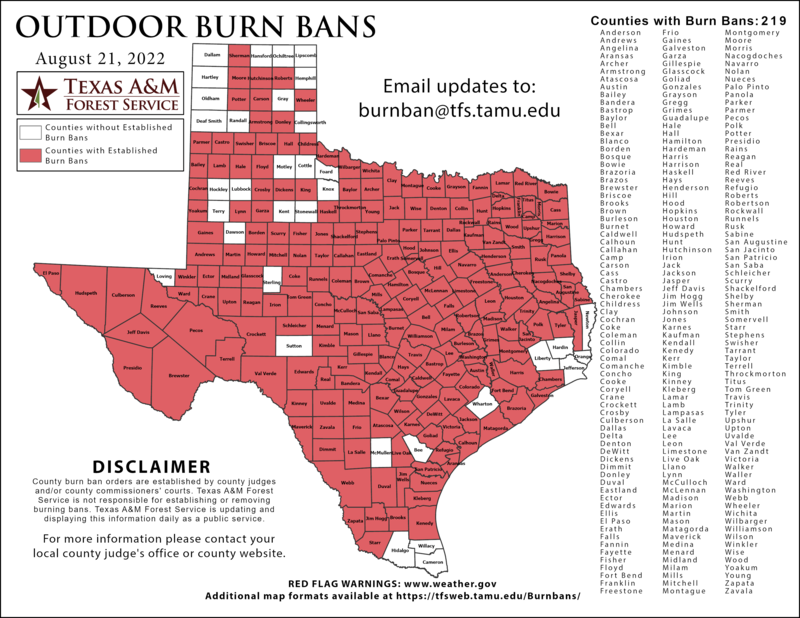 But humidity rose to about 25 percent in the Amarillo area by nightfall, which could offer some relief to firefighters, Stanford said. Another wildfire scorched about 21,000 acres in a remote area north of Midland, just east of the Texas-New Mexico line. No homes were reported damaged, but smoke from the blaze was blamed for the fatal accident along Interstate 20. Cameron Dominguez, 5, died in the accident, while Juan Dominguez, 30, and 9-year-ol Elijah Arp were taken to Midland Memorial Hospital. Hospital spokesman Mike Ross said Dominguez was in stable condition and Elijah had been treated and released. The blaze that injured the firefighter near Colorado City, about 240 miles west of Dallas, destroyed three large oil storage tanks, two homes and an outbuilding as it scorched 800 acres. A local hospital and nursing home were evacuated late Sunday as a 1,000-acre wildfire approached, Kearney said. Evacuations were ordered in Matador, about 90 miles southeast of Lubbock, as a wildfire burning across 500 acres bore down on the tiny town. Motley County Judge Jim Meador said at least two homes were burned in the town of about 650 residents, and the fire was still threatening the south side of Matador as darkness approached Sunday. The evacuation order was expected to extend into at least Monday morning, he said. "It's still going good. It's moved through the southern edge of town and hasn't been contained. You can't see that area very good because of the smoke, but I've got reports of two homes burned," he said. A wildfire prompted the evacuation of the southeastern part of Borger, about 40 miles northeast of Amarillo. But Borger Emergency Management Coordinator Danny Richards said the imminent threat had eased as of nightfall Sunday. Three houses in in southwest Lubbock suffered severe damage from a wind-whipped grass fire Saturday afternoon, Robert Loveless, spokesman for the city Fire Marshal's Office, told the Lubbock Avalanche Journal. The newspaper reported a 5,000-acre grass fire three miles south of Levelland destroyed one house and two vehicles. Another fire just south of Amarillo had burned about 2,000 acres by nightfall Sunday, according to the Texas Forest Service. Makkhavane said 17 to 19 homes in that area were destroyed or damaged. Texas Forest Service spokesman Lewis Kearney says lower winds have helped firefighters contain the intense blazes that began Sunday. They include a 30,000-acre fire that destroyed several dozen homes near Amarillo, and a 40,000-acre fire that forced the evacuation of the town of Matador. Kearney said Monday's critical areas stretch from Austin to San Antonio to Houston because of low humidity, warm temperatures and very dry conditions.